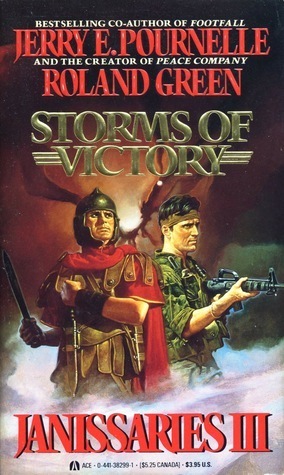 Jerry Pournelle – THE BOOKS THAT TIME FORGOT. Captain Rick Galloway is still on the planet Tran with his mercenary company. He has successfully formed an alliance between the kingdom of Drantos, Tamaratheon and the Roman Empire. Whats more a renegade faction of mercs lead by corporal Arnold Gengrich have come back giving him needed experienced men. He needs them for there is still plenty of enemies to fight. To the south a religious fanatic who opposes the new merged religion of Yatar and Christianity. To the north is the Five Kingdoms that want to retake Drantos and they outnumber Galloway’s forces by five to one. Only the star weapons and advanced tactics might win the day. All the while the alien confederacy continues to debate the fate of humans on both Tran and Earth. The third entry in the Janissaries series has what made the first two great. Plenty of set piece battles that could go either way. Medieval intrigue, the threat of aliens bombing them and the approach of the Demon star which will plunge Tran into environmental ruin. We do get more insight into the aliens but it is still fleeting. A good portion involves the Lady Tylara who is feeling guilty for having a trusted friend assassinated. Carodoc a loyal general was married to Gwen Tremaine the girlfriend of the human Les who is working for the alien Shalnuksis. His return threatened to cause a problem that could either disrupt the alliance or anger the aliens. His death made the problems conveniently go away but now she suffers guilt and even tries to commit suicide by charging the enemy alone in battle. She gets captured and manages to bring a count from the enemies side to hers. So the book ends with them victorious after a big battle. There was obviously supposed to be another book forthcoming. 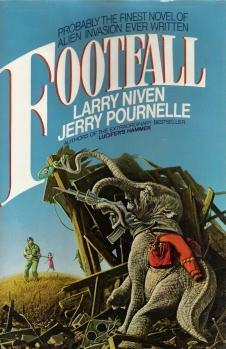 Pournelle and Green for some reason pursued other projects and it was never written. 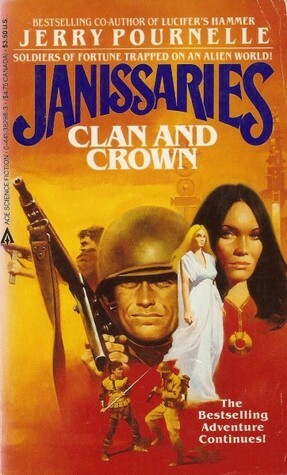 Pournelle had been working on the fourth book Janissaries The Mamelukes. Although Jim Baen didn’t like the title. Probably because most people wouldn’t get the Mameluke reference. The Mamelukes were the Muslin rulers of Egypt and the main rivals of the Ottoman Empire. The Mamelukes were on the losing end and the Ottomans extended their empire into North Africa. Whatever the title the book is mostly finished but sadly Jerry Pournelle died last year so the future of the book is in doubt. It was supposed to end the story and tie up all the loose threads. I would hope they can find someone to finish it and it gets a release. It would be nice to get some closure to this fascinating and unique series. I guess only time will tell if that happens. It has been several years since the alien Shalnuksi brought Rick Galloway and his CIA mercenaries from a certain death in Africa to the planet Tran. Now they have settled in with Rick marrying a countess. Most of the mercenaries are now follow him and he has alliance with the kingdom of Drantos and Tameraethon. Time is getting short for him. The Demon Star the third sun of Tran is making its 600 year appearance. He has to start growing the madweed for the aliens. Otherwise they won’t trade ammunition, medicine and other modern necessities they need. The Demon star is already causing massive disruptions in the weather and refugees are starting to pour in from the south. His first move is to form an alliance with Rome. The Romans are in a civil war in no small part to him. His victory over them caused a losing general to revolt. Galloway joins the rebel general to make him Caesar and secure a powerful ally. No sooner than that war is over than another threat from the west. Hordes of Westmen the descendants of the Scythians are coming from the high plains to escape the drought. All this while setting up a university to preserve knowledge for the coming disaster. The second book sees Roland Green join him in writing. Another excellent book filled with big medieval battles. Throw in some modern weapons to give it an interesting twist. Add to it medieval machine politics and an alien race of drug dealers who are going to bomb the planet back to the stone age so it stays primitive. The main concern is to preserve his new university so knowledge will survive the coming catastrophe. The book does a good job of showing how life was in the middle ages and some of the more simple measures in hygiene to improve society. There is still the threat of the aliens and this mysterious Confederacy. Not much is talked about that which I would have liked to see but there was plenty of time for that in future books. At least at the time it seemed that way. Which we will go over in the next book. Captain Rick Galloway is the head of a group of CIA mercenaries in an unnamed African country. They are their to help the local rebels overthrow the Marxist government. Unfortunately thing didn’t turn out good and now they find themselves on a hill surrounded by Cuban troops. They can either surrender and get a public show trial before they are executed or die fighting. Then a miracle happens. A flying saucer lands and offers to take them to safety. With no other option they quickly accept and are flown to a secret base on the Moon. It is here they find the real reason they were rescued. The aliens want Galloway and his mercenaries to go to the planet Tran. A planet that is inhabited by humans that have been stolen from different periods and is in a medieval state. Every six hundred years a third sun comes and makes the growing of a drug feasible. The aliens want Galloway to use his modern weapons and establish control of an area to grow this drug. With little options he agrees and are taken to Tran. Soon after landing Andre Parsons one of the mercs stages a coup and deposes Galloway as leader. With the pregnant girlfriend of their human pilot and one deserter from the mercs he heads out alone. Along the way they link up with Tylara who is a deposed countess and head to her family lands of Tamaerthon a people descended from Celts. With Galloway’s help they organize modern pike formations and take on the Empire of Rome. Galloway is establishing himself but there is a greater threat from the aliens and the Galactic Confederation they belong to. 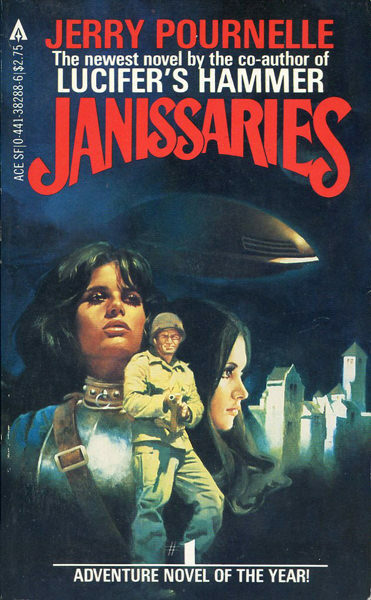 The first in the Janisarries series by Pournelle. I think it is one of my favorites of his work. It has the common themes to his stories i.e. a decadent stagnant society vs. the human desire to grow through technological advancement. In this instance the Galactic Confederacy is a collection of alien races that has ruled for over five thousands years. They do it by keeping the peace through stagnation and no change. Also they use humans as Janissaries. Janissaries were the slave soldiers and administrators of the Ottoman Empire. They took as tribute the first Christian son from a family and raised him. A successful system that saw them eventually becoming the power brokers of the Ottoman Empire. They grew too powerful and had to be disbanded. So humans in this Confederacy are the Janissaries of the Confederation. Now with Earth starting to advance into space the Confederacy is looking at options to force them into the Confederation and control them or bomb them back to the stone age. Some of the human slaves work to conceal Tran in the hope it can be a bastion of human freedom. I really think this is a unique story idea. Taking a group of modern mercenaries kidnapped by alien drug dealers and dropping them on a medieval planet. There is plenty of adventure in the realistic battles fought. There is the medieval intrigue of Tran plus the threat of the aliens as Rick Galloway tries to build an empire on Tran to save it from the coming catastrophe. Galloway eventually kills Parsons and reestablishes control of the mercenaries which is where the first book ends. The Fithp an alien race that resemble baby elephants have come to Earth to conquer. They are a herd mentality species. In their world when two herds meet they fight one another until the one surrenders. Then the losing herd is incorporated into the winning herd. The Fithp seem confused when humans attempt to initiate peaceful contact first. Also the humans seem to not know how to properly surrender. The initial acts of the Fithp is to destroy the space station in orbit then bomb all the bridges, dams and roads on the planet. They then follow with an invasion of Kansas demanding complete submission. The U.S. and Soviets respond with a nuclear attack on Kansas to drive them off. The Fithp retaliate by dropping a large asteroid into the Indian ocean killing millions. A successful invasion of Africa follows. The only chance for the humans is to build a ship powered by nuclear explosions to take on the mother ship in orbit. The cover says that this is probably the finest novel of alien invasion ever written and I agree. I received the hardcover edition as a Christmas present back in 1985. It made me a fan of Niven and Pournelle. I have since read many of their books. This is probably my favorite. What I like is that the aliens are truly alien. They have a completely different physical and psychological makeup yet each character has his own emotions and personality. The cast of characters both alien and human is diverse. The technology sounds realistic and plausible. The Orion ship powered by nuclear explosions is actually a real concept. So if you like epic alien invasion stories than this is a must have for your library.